← Did you know? : The myth that ALL Sephardim eat rice. As I said I would, I cooked this tonight, and as I promised, here are my commentaries. I did 2/3 of the recipe, using a 9×9 ish pan instead of 9 x 13. I used matzoh cake flour instead of meal because that’s what I had. I don’t think it made a difference. Since the zucchini are schredded, there is no reason to be fancy with the peeling; I peeled half and left half unpeeled, for the same result as striping all of them. I cooked it for about 55 minutes, until the top was pretty solid, way less than the 1 1/4 hour specified in the recipe. But I was a little under, and the crust was golden brown but not dark. Another 5-10 minutes, until dark brown, would have made it better. As it was, it was the texture of a fairly soft quiche more than a cake. The bottom line, though, is that I will do this for Passover. I will cook it to a dark brown next time. Thanks for the recipe. I have seem others, some of which call for a more souffle like dish with eggs separated and whipped whites folded into mixture. Probably good. 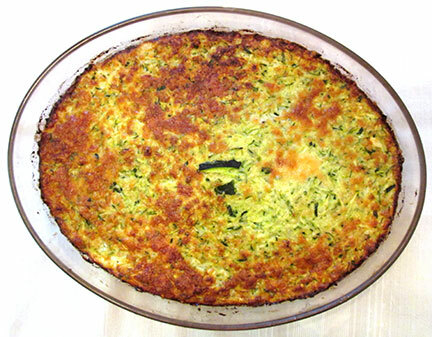 There is a recipe for “crustless zucchini pie” in The Turkish Recipes Cookbook by Nur Ilkin and Sheila Kaufman that is similar but adds dill, which sounds like a good idea, scallions, aleppo pepper and baking powder, which could improve the texture (and, surprisingly, is OK during Passover). I am not sure which, if any, modifications to make. Probably dill and aleppo pepper, which I love. By the way, the cheese I used was a Greek kasseri from Fairway. Nice. Thanks for the report Bob! If you made a smaller batch of the recipe and baked it in a smaller pan, it would take less time to bake. The texture should be somewhat soft, but should congeal as it cools a bit (it’s best to let it sit until warm or room temperature before cutting into pieces or it might be too soft and stringy). Glad you liked it! 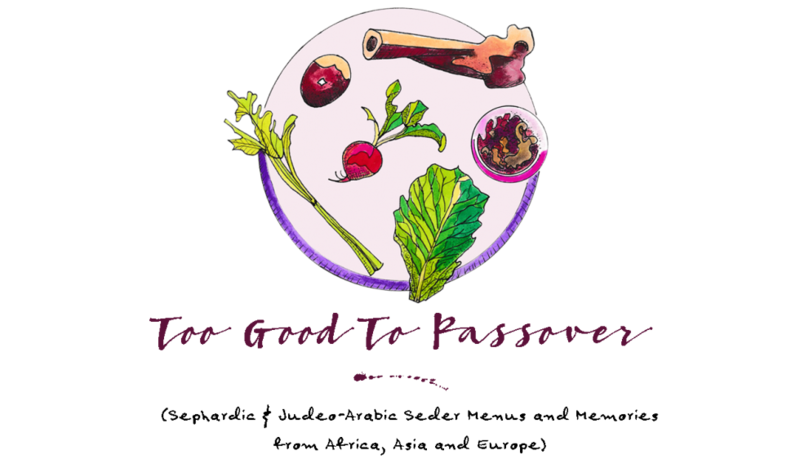 Inspired by your Persian New Year’s cooking lesson at ICE in 2013, I decided to do a Sephardic Seder this year, and have been doing research ever since. My goal is to provide a great meal with dishes from at least five countries. So here’s how my Sephardic Seder is shaping up. -Charoset from Bordeaux style from Joan Nathan’s “Quiches, Kugels and Couscous: My Search for Jewish Cooking in France,” but substituting figs for 1/2 the dates called for. I like the freshness of it, no cooking and, surprisingly, no wine. This after I tried a bunch of others, which I generally found too sweet and mushy. -Maybe a salad. Radishes, orange slices, spinach. -Orange cake, a variation that I do on the one in Roden’s “Book of Jewish Food? -Another dessert with no nuts for my allergic brother-in-law: hard to find because nuts are so predominant in this type of cuisine. Any reader’s thoughts would be welcome. I would love to hear about the orange cake recipe and may even post some dessert recipe very soon so that you and other blog readers can try it! It’s tricky to find something without nuts for Passover, but I will look and see what I have! Here’s the recipe for the Flourless Orange Cake. I give Clotilde Dusoulier’s recipe as it is, together with my commentaries). I don’t feel like too much of a plagiarist since she posted this on her wonderful blog, http://chocolateandzucchini.com, which I encourage everyone to visit. •	60 g thick Swedish pearl sugar, the type used as a topping for chouquettes or brioches (available online). Substitute old-fashioned lumps of sugar (like sucre Candi or La Perruche) or ordinary lumps of sugar, crushed. 2. Clean and scrub the oranges well. Put them in a medium saucepan, and cover with water. Put the saucepan over medium heat, and simmer for two hours, adding a little hot water when the level gets too low (note: some may find the smell of whole oranges boiling very unpleasant, but it has nothing to do with the smell or taste of the finished product). Drain, and let cool. Cut in quarters and puree in the food processor. 3. Peel and chop the fresh ginger. Cut the candied ginger in small dice. In a large mixing bowl, beat the eggs with a fork. Whisk in the orange puree, the sugar, the almonds, the baking powder, and the fresh ginger, until well blended. Fold in the bits of candied ginger. 4. Pour the batter in the cake pan, and bake for about an hour (a little more if using 9-inch pan), until puffy and golden. Let cool for a few minutes on a rack, while you prepare the frosting. Run a knife around the cake to loosen it, and remove the sides of the pan. So I noticed that this recipe contains baking powder, which is probably the standard baking powder. For Passover you would have to use kosher for Passover baking powder. I have to admit that with all the rules about what you cannot eat during Passover, I was surprised to see that there is even a KLP version of baking powder out there! Has anyone used this product, and does it work? By the way, Claudia Roden’s The Book of Jewish Food has a very similar recipe, without the crystal sugar topping, which calls a Judeo-Spanish cake. Will have to look at it. I wonder if it also has baking powder in it? Yes, but it’s not billed as a Passover recipe.